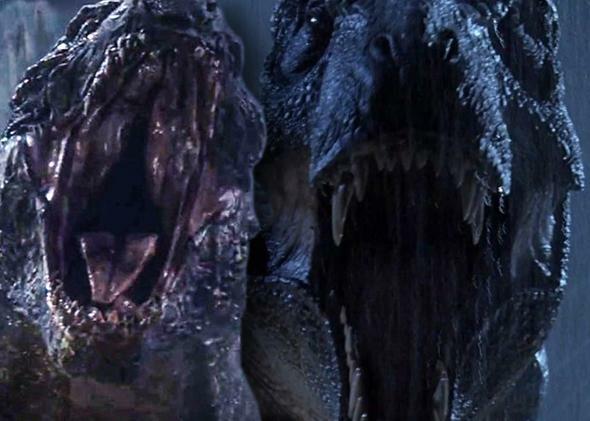 Godzilla and Spielberg: What Gareth Edwards’ 2014 reboot draws from Jaws, Jurassic Park, and Close Encounters. How Godzilla director Gareth Edwards cloned the formula behind Jaws, Close Encounters, and Jurassic Park. Godzilla (left) borrows up and down from Spielberg blockbusters like Jurassic Park (right). Two weeks ago aspiring filmmaker Anthony Trombetta took the audio from the trailer for the new Godzilla and mashed it up with video from Steven Spielberg’s 1975 classic Jaws. The result, goofily titled “JawZilla,” works surprisingly well. And now mashup maven Zach Prewitt (whose work we’ve highlighted before) has taken the same approach with another Spielberg blockbuster, Jurassic Park. Though Joe Brody was originally based on the hero of Jaws, in the end the filmmakers seem to have modeled him much more closely on the hero of Close Encounters. Like Roy Neary (Richard Dreyfuss), Joe Brody is an engineer at a power plant before he becomes obsessed with investigating the source of a mysterious electrical failure. After witnessing inexplicable events during the failure, he begins, like Neary, to behave strangely, developing increasingly elaborate theories (think mashed potatoes) that eventually alienate him from his family, who fear he’s gone insane. This leads to the kind of troubled father-son relationship that is a recurring theme in Spielberg’s films (see also E.T., War of the Worlds, the third and fourth Indiana Jones films, and Catch Me if You Can). But both Neary and Brody turn out to be right: They each go into a quarantined zone that’s closed off by the government under claims of poisonous gas. In both films, the heroes take off their gas masks to discover there’s nothing wrong with the air at all—the quarantine is just the government’s excuse for hiding the zone where they’re studying the creatures. The monsters, too, bear some resemblance to the aliens from Close Encounters. In Godzilla, the monsters often arrive in an eerie silence because their supercharged bodies function like an EMP, shutting off all electronics in the area. This is an old trick of Spielberg’s: In both Close Encounters and in Spielberg’s 2005 War of the Worlds, the aliens do the same, shutting down everyone’s electronics prior to their arrival. In Close Encounters, in particular, this is used to famously eerie effect, shutting down Neary’s car and radio before the aliens finally pull up behind him. Even in Jurassic Park, in which the dinosaurs do not, unfortunately, have any EMP capability, they still emerge from behind electrical fences in the midst of a complete power failure, just like the monsters in Godzilla. The next set piece in Godzilla is also straight out of Spielberg: The monsters bat around an airport tram, knocking it off a cliff (in this case the track), in the same way that the T. rexes bat around the SUVs in Jurassic Park and the tractor trailer in The Lost World. And Godzilla uses all Spielberg’s key visual motifs. Most frequently he focuses in on what is perhaps Spielberg’s defining image, the Spielberg face, as Vulture also noted earlier today. As in Spielberg movies, Godzilla frequently dollies in on wide-eyed faces staring on in awe. Photo by Courtesy of Warner Bros. Picture - © 2014 Legendary Pictures Funding, LLC and Warner Bros. Entertainment Inc.
Screengrab from Jaws via TIME. The other Spielberg signatures are here, too: Flashlights and streams of light, probing through the darkness. 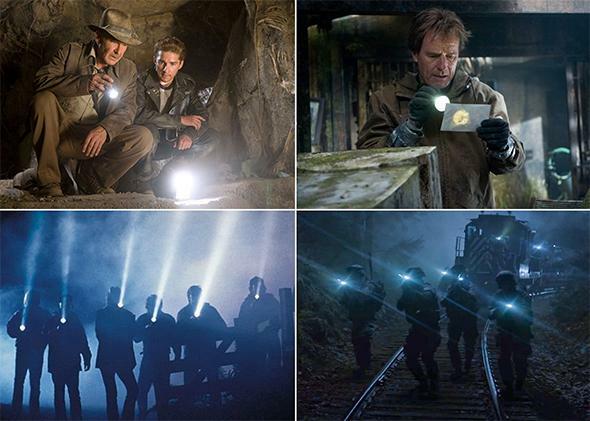 Flashlights in Indiana Jones and the Kingdom of the Crystal Skull (top left), E.T. (bottom left), and Godzilla (right). Image composite by Slate. Still © 2014 Legendary Pictures Funding, LLC and Warner Bros. Entertainment, Inc. Even the use of those sizzling flares in that shot above—and in the close-up of a flare lighting up Godzilla’s skin—is reminiscent of the flares that light up the tyrannosaur in his first appearance in Jurassic Park. There’s also at least one shot that Edwards has stated is an homage to Jaws: In one scene, Edwards shows us Godzilla passing under an aircraft carrier in the same way that Spielberg shows us the shark diving under Quint’s boat. Thus far critics haven’t focused on Godzilla as a Spielberg homage as much as they did with J.J. Abrams’ Super 8. Perhaps this is because people now think of Spielberg as a sentimental filmmaker, whereas the pretty unsentimental Godzilla draws from many of the less sentimental aspects of his work. Regardless, the formula works. There is at least one other that way Godzilla is reminiscent of those Spielberg classics: It’s already a juggernaut at the box office.